Bob Seely opposes a Fixed Link… according to his web site. His reasons for doing so are purely opinionistic and not evidence based. Why would the MP so fervently obstruct an IOW fixed link campaign, while at the same time, using his position to protect the two powerful ferry companies? It has become apparent (with evidence) that the MP had a predetermined agenda to assist Red Funnel and Wightlink, as set out by previous IOW Council leader – David Pugh since 2009. 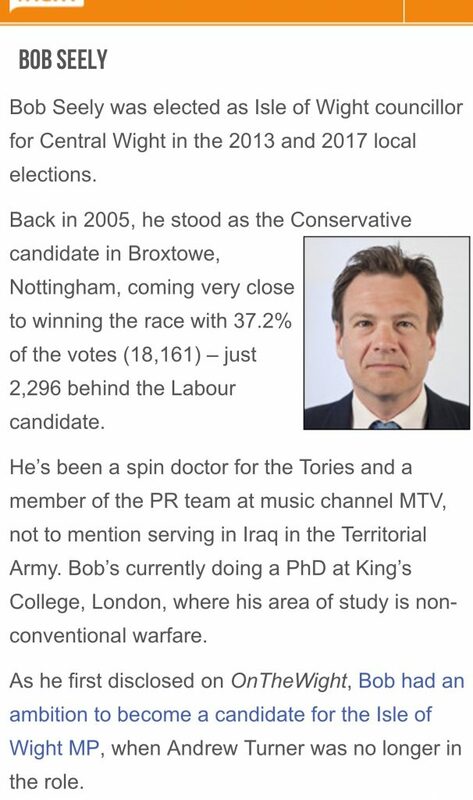 The two first became aquainted after Bob Seely had failed to secure a seat at Broxtowe, Nottinghamshire in 2005. David and Bob have assisted each other politically, with David carefully orchestrating the arrangements for Bob to become IOW MP. These arrangements included having the IOW Conservative Association pay for Bob Seely’s campaign to become an IOW Councillor. It was during this time as councillor, he became nicknamed ‘seldom seen Seely’ due to the infrequency of participating with council business / meetings. An island address on the island was essential for the image also, as Bob Seely had never lived on the Isle of Wight. A converted garage on a farm was rented to fulfil that requirement. 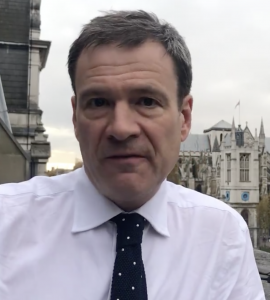 … while also explaining that Bob Seely is now rewarding David for orchestrating the MP’s campaign, by lobbying for David’s clients in Westminster. Bob Seely is now the conduit for ‘Chine Consultancy’ at Westminster, who’s client… is Wightlink. An explained example of Bob Seely’s work in Westminster for David Pugh and Wightlink, has been the negotiations to have Islandline train service receive government funding to retain the Ryde PierHead connection with the line to Shanklin. This connection is essential for the viability of Wightlink to operate it’s ‘FastCat’ service at the end of Ryde Pier. 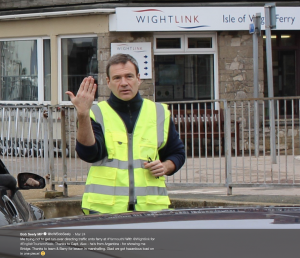 According to David’s wife and Chine Consultancy Director – Rachael… Wightlink apparently sought the funding from government through chair of KILF (Keep Islandline in Franchise) – David Pugh and David handed it on to Bob Seely …Read more. David was asked repeatedly on social media, whether he had been on the payroll of Wightlink either directly or indirectly? David refused to deny or confirm it. The cousin of Bob Seely, was instated as a Director of Red Funnel just five months after the MP was elected. Patrick Seely now works for Red Funnel as a non-executive Director… read more It would appear that Bob Seely’s position as MP has facilitated his cousin’s post on the Red Funnel Board. During 2016, the ‘IOW Transport Infrastructure Taskforce’ was commissioned by the IOW Council via central government funding, to undertake a comprehensive study of cross Solent transport. The conclusions were clear… the report recommended that a Fixed Link Study must be undertaken. Since then, the IOW Council have also officially endorsed support of a Study, joining Christopher Garnett OBE, who chaired the Taskforce along with several major island stakeholders. All islander surveys and polls are in favour of a fixed link. However, even with the support of all the above, the MP has autonomously obstructed due process. As yet after numerous requests to do so by many constituents, Seely has not made one mention of the subject at Westminster. The IOW Transport Infrastructure Taskforce that investigated both ferry companies has now been disbanded by Seely… it now does not exist. In it’s place, the IOW Transport Taskforce has been implemented that includes both Red Funnel and Wightlink as main stakeholders. The interview is a good indicator of the MP’s thoughts and ideas regarding the island. To listen to the whole interview… click here. These are excerpts below to save time. Seely explains his 15 year plan for the isolated island. …. the belief is that the MP’s present policies generated through an emotive personal passion for the arts and unwillingness to accept the beneficial foundations of fixed link connectivity… while also protecting both IOW ferry companies from competition, will be a disaster for the island. The MP appears to be wilfully ignoring the “Elephant in the room” problem of all important cross Solent connectivity. REPORT ON THE PRO-LINK (Carl Feeney) and ABLE CONNECTIONS LTD (Carl Feeney and Tim Cooper) MEETING WITH BOB SEELY on 12th December 2017. The first objection is that it will “cost vast sums of money,” saying that “the Island cannot afford it.” The ferry companies turned over more than £110m last year. That clearly represents that the Solent economy can afford to spend enormous sums of money crossing the water. Our forecasts, carried out in accordance with Department for Transport requirements, show that it would require only a 60% increase in cross-Solent people movements to generate sufficient revenue to pay back construction costs within 20 years. We believe therefore that the scheme is affordable. We have worked with KPMG’s Deal Advisory team to understand how the scheme might be funded and financed. We believe that there is a range of possible financial mechanisms which align very closely with Government objectives. The cost is large – £3Bn – and it is right that it is hard to justify spending this much money on a population the size of the Isle of Wight. However the benefits of the scheme extend across the whole Solent region, including the deprived areas around Gosport and the industrial and commercial centres around Park Gate and Whiteley. Furthermore, the tunnel is not the only item of infrastructure proposed for the Solent region. Significant enhancements are being considered to develop tram and rapid bus services. The tunnel is complementary to these schemes; it makes them more deliverable and it increases their benefits once built. It also unlocks land for housing on the mainland. When considered in the context of the current plans for the Solent region and the population served, we believe that the cost is proportionate. The second objection is that the Island’s “19th century infrastructure would not be able to cope with the inevitable increase in traffic”. In order to address this, it is helpful first to consider what the Island will look like in 20 years time without the tunnel. The current forecasted population growth on the Isle of Wight (without the tunnel) is around 10,000 – 15,000 people over the next twenty years, almost exclusively in the over 65s. This will happen because cheaper housing makes the Island an attractive place to retire to and because people are living longer. It will impact Island infrastructure in different ways. We have sufficient schools and healthcare facilities; the sewers do not need major upgrade; our energy could probably do with being greener, but there is no threat to our supplies from the mainland, and our broadband works. Indeed we believe that most of the Island’s infrastructure could cope with the forecast increase in population. The infrastructure which will be put under strain by this population growth (which will happen without the tunnel) is housing and transportation. The Isle of Wight Council is currently developing plans for additional housing which distribute developments over the whole Island. These are not sufficient to meet demand and further development will be required. Recent housing developments and those which are coming forward are all car-centric, and the Council has no plans for additional public transport. Indeed it does not even propose to update its highway forecasts until 2019 at the earliest. We believe that this is too late and urge you to apply pressure to the council to accelerate this important work. The true statement about infrastructure is that in 20 years’ time, the Island’s “19th century” transportation infrastructure will not be able to cope with the forecast population growth, period. Worse, because of the demographics of the growth, there is unlikely to be sufficient economic growth to pay for any enhancements. The tunnel proposal is an improvement on current plans for a number of reasons. 1. It includes proposals for public transport, extending many miles from the tunnel portals on both the mainland and Island sides. This will mitigate many of the highway impacts of population growth by providing viable alternatives to private car use, even for highway trips which do not use the tunnel. Future autonomous electrically powered vehicles, will not be encumbered by ferry mode cross Solent transport. 2. We welcome the opportunity to engage with the council about how this project will allow them to develop housing schemes which are well-integrated with public transport and which will therefore generate fewer trips than would be the case under current plans. 3. It will stimulate economic growth, leading to more revenue to the council to provide services. The pressure on the Island’s transport infrastructure is going to increase as its population grows. We believe that the tunnel allows us to manage that growth in a way which gives better outcomes than current plans. The tunnel will allow the Island to meet its housing needs in a more sustainable way than current plans. However we do not accept the assertion that the tunnel means the Island will be subjected to overwhelming pressure to accept housing from Hampshire. The Solent authorities are planning a major new development at Welbourne, north of Fareham. Let us take the view that this is the land facing most development pressure in the region and compare it to the Island. The cost of getting to the Isle of Wight (combined time and fares) means that land on the Island is currently less accessible from Welbourne than Royal Leamington Spa. The tunnel will bring it closer, but not to the extent that it faces pressure to become a dormitory suburb. For commuters it will become as accessible as land in west of Salisbury, and for businesses it will become as accessible as land around Basingstoke. In other words, we believe that the proposed tunnel with its relatively high toll will bring the Island the best of both worlds; businesses get closer and more efficient, but the demand for land for housing becomes no greater than is felt by the rest of the south coast. It is disingenuous to claim that improved connectivity will result in a loss of services. No school or supermarket or GP or restaurant or theatre or police station or cinema or fire station on the Island is going to close as a result of the fixed link. These services generally rely on their proximity to the people they serve, and are often ideally planned within walking distance. Indeed, by its very nature the fixed link will increase the services available to Islanders by allowing them to access services not currently available on the Island. The second service which may be affected is retail facilities. Different retailers will be affected in different ways. The tunnel will not greatly affect access to the retail parks at Gunwharf and West Quay, as these are in the city centres where they will continue to be most easily accessed by the passenger ferries, and so will be no more competition than they are today. Access to the superstores at Whiteley will improve, and this might affect trade at superstores (electrical goods, carpets, furniture, cars etc). We believe that by making the Island more accessible to destination shoppers in south Hampshire, the link will benefit retail in the Island’s villages. These shops tend to be independently owned, and the money spent in them is more likely to stay in the economy, bringing even wider benefits to the Island. Finally, although not numbered as one of the objections, there is reference to the detrimental environmental impact of the tunnel. “Environment” covers many different things, and schemes need to be assessed both for their construction and their operation. We summarise here the main impacts of the scheme, which we believe will give a net benefit to the environment when compared against the “do-nothing” scenario. CO2. The tunnel will be constructed using concrete and this will generate carbon emissions but will have a life of 100 years+. In operation it will require power to operate lights and ventilation, which will generate emissions until renewables become more commonplace. It will support a vastly expanded public transport network which will reduce congestion on major roads, reducing carbon emissions. The net effect of these needs to be assessed but we believe it will show a net operational reduction in CO2 emissions in the Solent region when compared with a do-nothing scenario. Habitat. The tunnel portals and access roads shall be constructed in made and agricultural ground and will result in very little loss of habitat. Further studies are needed to define the northern portal with the M27, and environmental considerations will form a major part of how options are assessed. The need for ventilation shafts also needs to be determined, and certain configurations may require shafts in the Solent which will disrupt the seabed. However, this particular scenario may be negated due to the advent of low emission vehicles. The spoil from the tunnel can be cleaned and used to construct new wildlife mudflats. The tunnel will provide access to land for housing which is integrated with transport and therefore allows more sustainable land use for both housing and transport. Air Quality and Noise. A twin-bore, dual-carriageway configuration of tunnel would remove 15-20% of the HGVs from the centres of Southampton and Portsmouth. By enabling an expanded public transport network all configurations, it will reduce congestion on major roads, which brings air quality and low noise benefits. By placing growth in highway trips in a tunnel we reduce highway noise in the region. Construction Impacts. The proposed construction methodology minimises the number of HGV movements generated by the scheme to the extent that we aspire to send no spoil by road. The major tunnelling work takes place away from homes and should not generate significant levels of discernible noise. Thank you for a very productive meeting, and for giving us so much of your valuable time. It was good to hear about your plans for the Island and to find so much common ground between us. The Island is an amazing place and all four of us round the table shared a commitment to working to preserve and enhance its many assets. We attach a copy of the document we left with you. We’ll tidy it up and then publish it via the ProLink Facebook page and Solent Freedom Tunnel website as a direct response to the comments on your website. This conversation is important and it needs to happen in public. We all agree that it should be conducted without recourse to any of the fallacies which mar serious debate – so no ad hominem attacks and no straw-men. If you feel we’ve made those or any other errors, please let us know. 1. Any feasibility study needs to be properly engaged with stakeholders in the region. Simply saying “go away and do your study” is just another way of shutting the door. No one, private or public, is going to fund a study without suitable governance or engagement from public bodies. Once in place, these governance arrangements do not need to be a major drain on your time, but as MP we trust you agree that you have an interest in ensuring that they function transparently and that the feasibility study takes account of all the issues which you feel need to be addressed. However we would go further. Neither of us can set out our case for the future vision of the Island without first establishing the “do-nothing” scenario if we allow current trends to continue. Without this evidence base both your manifesto and our proposals will be meaningless. The interests of Able Connections and yourself, at least for this first step, are completely aligned. I hope this is something you and I can discuss further in the new year, perhaps with Dave Stewart. 2. The Gurit story is misleading. In a functioning economy, companies come and go for all sorts of reasons, so demonstrating that Gurit’s departure is not caused by a lack of connectivity proves nothing. The relevant story is “my colleagues” story. Fifteen years ago, two of my school friends and I, cut adrift from GKN, could not establish our separate businesses on the Island but prospered on the mainland. Those bright young islanders cut adrift from Gurit today will do exactly the same and the Island will suffer. Lack of connectivity is a major part of this story. 3. We agree that future housing on the island needs to be high density (to minimise land take) and integrated with public transport (to minimise highway impacts). 4. We hinted at a useful distinction between a viability study and a feasibility study which is worth making explicit. A viability study would demonstrate that there are sufficient trips to generate income to pay the capital costs. It would need to be sophisticated enough to take account of transport, population and land-use changes and the many ways these interact with one another. Fortunately the Solent subRegional Transport Model (SRTM), operated by Systra on behalf of Hampshire CC, is designed for this purpose. It’s structure and operation is based on the work I led for TfL which is now used for all major development planning in London, and Systra were one of the major suppliers. We have scoped this work with them and it could be done for under £100k. Once we have established that the commercials stack up, a feasibility study would need to look at how we join everything together (precisely where do we allow development and how much; where does the bus go; do we carry freight; ); how the economy grows; how we capture a proportion of that growth to fund the capital costs through things like a TIF or land value capture vehicle; what configuration the tunnel takes and the associated construction costs. 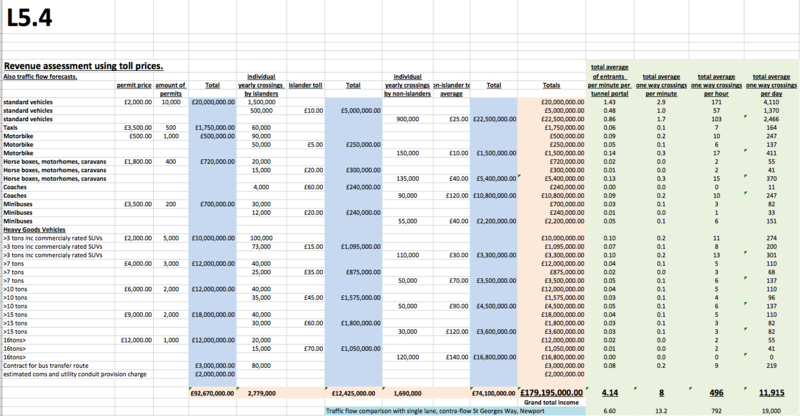 This is a much more extensive piece of work and would cost around £1m. We’ll close simply by repeating the sentiment from our earlier email. It is a pleasure to have an MP who appreciates the challenges and opportunities which arise from the uniqueness of the Island’s representation at Westminster. We very much hope that we will be able to work with you as you seek to preserve and enhance the quality of Island life. Hi and thank you for your time, and I hope that we can perhaps now have a constructive dialogue. I am concerned with the first point you raise. I think there is a misunderstanding. Initially, I understood that the ‘understanding’ with the Council was that no one would object to a study into the proposed cost and impact, but that it was going to be organised by yourselves. In the wording of the document below, you are now saying that I and others need to be actively supportive and part of a process. That is a very considerable change, both in practical involvement as well as percieved support to the project. I feel I am being engineered into a position that I am not comfortable with. You need to be discussing this with the IoW Council and mainland Councils as a first step. I did make clear that I have limited time, and that, as we both agreemeent, the numbers are not currently there. I welcome your thoughts on the above. I am aware that there is room for nuance. I have talked already to the Sec of State Transport. 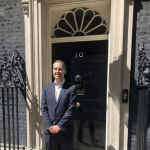 He has questioned whether there could be funding this year, he believes it unlikely, and suggested that even at a very initial stage, the Treasury would need to be involved. I will take the matter up again in February, but as I made v clear, this project cannot be my priority. As you say, there is room for nuance. We are certainly not trying to engineer anyone into a position they’re not happy with. In fact, I hope it’s the reverse. During a complex study like this, conclusions arise as the work progresses which were not foreseen and which might be objectionable to some parties. The earlier people see the results, the better the opportunity to deal with objections. It is very sad when major schemes have detrimental effects baked into them for no better reason than they were discovered too late to be put right. My motto for stakeholder engagement is “go wide, go early”. The fixed link will only happen if it is the right thing to do (by which I mean, out of the available responses to the ongoing demographic challenges we face, it is the response which makes the Island most prosperous in a way which best supports and enhances its character). To determine that, we need to proceed with everyone’s involvement. You’ve made a very clear statement on your website the reasons you would object to a fixed link. We will ensure that any study addresses these, but we don’t want you or anyone else to be trapped – you need to have the opportunity to be involved and modify your view as work proceeds. How you choose to do so is your choice, but my point about the need for a better understanding of the do-nothing remains valid and I will continue to seek ways to work with you and the council to establish that common view. We would welcome the opportunity to meet with Treasury. Is this something you can help facilitate? Re: Treasury. Not yet. Let’s talk again in late January please. What happened after the above email exchange is quite extraordinary. Oh dear. What a privileged lifestyle this man has led. He truly has no ideas how the majority of Islanders have to live. He will certainly not solve any of our problems with an art gallery. If his ideas will take about fifteen years that will also be much too late Get out there Bob and speak to the people who you have the privileged opportunity to represent. And do just that represent THEM. At the moment you appear to be way out of touch with our reality. I like the openness in the approach that the Solent freedom tunnel promoters are adopting. It allows for a proper record of political and economic exchanges. I am slightly dismayed by the approach taken by Bob Seeley which is that I’m too busy to deal with this. This seems to be becoming a theme. We have a strong well led Conservative Council with talented Councillors and a greater openness to embracing development and regeneration projects. I hope that Bob Seeley will embrace a wider range of those talents and others to guide him through his priorities. Mr Seeley. For an MP that is supposed to represent the Isle of Wight you have a very selfish attitude to the freedom of islanders. Though you don’t live on the island and the freedom tunnel won’t effect you either way. I think you should help this island to grow back into a thriving island. You have shown no support for you constituents and the people that voted for you. What does this island need to do to get your support for us and not self gain.. sorry but it would seem you have become an MP for your own self growth in politics with no consideration for the people your supposed to support. I find this very disappointing in an MP.. you have lost a lot of support here on the Island..,. I am a retired Chartered Civil Engineer and have served my profession as a Council Member of the Institution of Civil Engineers and on the committee of the Southern Association of Civil Engineers. I spent three (extremely hard) years working on the Channel Tunnel, which I believe has proved itself to be an invaluable link to the Continent. There are many precedents for the use of a Fixed Link, whether it be a tunnel, a bridge or a combined bridge/tunnel, allowing the engineering decisions on such a design to be confidently made. It may be worth pointing out that the Channel Tunnel is ventilated by forced air using trains themselves to move air along the structure, backed up by fan-blown air along ducts. There is no requirement for ventilation shafts sticking up above the Channel! The report by Able Connections Ltd is a well balanced and sensible comment on all of the issues involved which should form the basis of both viability and feasibility studies. It is good to note the constructive approach in the discussions and summaries offered by Tim and Carl. 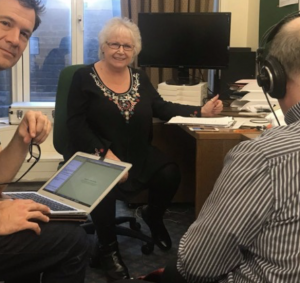 So much work has been done and so many issues discussed to prepare the way forward that makes it all the more distressing to note such a negative attitude by the Island’s MP. He has “run scared” from any implication of involvement from supporting a study into the Fixed Link, never mind supporting the link itself. It is such a shame that this Member of Parliament does not want to understand one of the most important factors affecting the life of Islanders both now and for the foreseeable future. Honestly, what the hell is wrong with Bob? He’s got all his priorities mixed up. He has ZERO regards to the people of the island, he clearly wears blinkers and has the typical tunnel vision (excuse the pun) of most campaigners who are against a tunnel being built. He is completely and utterly absent minded to the reality of the islands current and future state. The island is in dire straits and he’s harping on about art?? What about businesses, employment, education, health services, investing in tourism (historically the islands primary source of revenue)? All island residents are held to ransom by ever increasing energy bills, council tax, poor wages and ferry costs. I for one couldn’t stand it any longer, so due to the lack of opportunities and career options I was forced to commute to outside of Portsmouth to work. For the last 7 years I’ve had to do so, predominantly due to the lack of opportunities on the island. I love the island so I don’t want to relocate, but when you put into perspective that as soon as I started commuting I INSTANTLY got a 20% pay rise for performing an almost identical role. On top of this instant pay increase my career progression and opportunities accelerated. Ultimately an acceleration which I can guarantee would be unachievable on the island. This is factually badsed on the fact I had worked at one of the islands major employers for 7 years with VERY little progression and in my final year at said employer we were told that there would be no annual pay review or increase for the following 5 years! That’s when I woke up and decided to commute, I needed change. I can only presume Bob has no children, or doesn’t live on the island himself. Otherwise he would want the best career and life opportunities for his children, opportunities which are clearly not present to the future generation of islanders. Well done Bob! To bring the island back into modern times we need a fixed link to provide affordable access to tourists and businesses to let the island thrive once again. Bestival is just one example of a HUGE economic revenue which has been lost as a result of being held ransom by ever increasing ferry costs. To follow up on health services….. I keep reading that critically and terminally ill islanders are being subjected to pay (payments they are struggling to afford because of their illness and inability to work) for the ferry as the islands health service is on the brink of collapse! Sort it out Bob, it’s beyond a joke……as are you!! Bob Seeley . Selfish, blinkered man that has no thought for his constituents. Perhaps he needs to ask us , the people who live here a question. Would we rather have an art gallery or access to Heath care when we need it?